Among several factors of climate, the El Niño-Southern Oscillation (ENSO) and Sunspot cycles work on interannual to interdecadal scales and it is believed that while the El Nino–La Nina pressure seesaw of Pacific Ocean affects climate by altering global wind and rainfall patterns, the 11 years periodic variability of sunspot appearance bring changes in insolation and cloud formation. Thus, the role of these two climate forcings seems critical in pushing short term climatic variabilities. This paper attempts to know the impact of these two climatic phenomena on temperature and rainfall patterns at reginal scale, and for the purpose the study considers India as the case. Analysis reveals that temperature show a good correlation with sunspot activities, while the effect of ENSO cycle on country`s rainfall is not very clear. However, India’s coastal states record a notable rise in temperatures during El-Nino phase of ENSO phenomenon, and this may be the cause behind fragmented and uneven rainfall over the country during El-Nino years. Yielding from sun and varying with inclination, the climate of a place determines nature and state of biota flourishing there. However, atmospheric-oceanic-geomorphic changes modulate the climatic properties in course of time. Apart from these natural forces, today man also has developed the technology and skills to regulate climatic characters up to some extent. Natural forces that affect the climate, work on millennium to minimum scales whereas human role is limited up to a life span. The natural forcing are- Earth`s orbital variations, changes in solar output, plate tectonic movements, volcanism, meteorites, oceanic circulation etc. while the Chlorofluorocarbons (CFCs), fossil fuel burn greenhouse gases, industrial aerosols, and enhanced atmospheric water vapour are the ‘humanogenic’ causal factors of changes in climate. The discovery of the stratospheric ozone hole over Antarctica in 1987 propelled scientific research on role of manmade CFCs in atmospheric alterations. And soon, searching statistical significance in the man-climate change relationship became focus of correlation studies on this issue [1,2]. Most of these studies surmised that human additions in the natural climatic variability is the cause behind increasing temperatures, disrupted rains and intensifying extreme climate events. They tried to estimate the departure of climatic conditions from their natural course of variability. However, they considered natural forcings as rhythmic and predictable. But, climate is a dynamic system where all of its components are linked with feedbacks, and, therefore, change in one component may lead to change in one or the all. Measuring probable departures in all the directions is really an accuracy challenge. It is rather more realistic to measure the degree of association between natural forcing’s and climatic variability. If natural causes fail to synchronize well with climatic trend, it is indicative of some unnatural causes of change. The notable natural factors that affect the climate are- Milankovitch cycles, plate tectonics, sunspot cycle, meteorites, volcanism and El-Niño Southern Oscillation (ENSO). Orbital changes and plate tectonic movements are slow and long-term processes mainly responsible for climate reversal, while the sunspots, volcanism, ENSO like short-term forces induce rapid changes in the climate. Studies suggest that increase in sunspot numbers increases surface temperature of the Earth while decreases the amount of rainfall . Friis-Christensen et al. found in their study that increased sunspot activity strengthens the electromagnetic field of Sun and that blocks galactic cosmic rays to enter into the inner solar system . This reduction in the cosmic ray flux, then, reduces the cloud seeding rate and thereby reduces the amount of solar energy reflected back by clouds directly to the universe. And by this process the enhanced amount of solar radiation reaching the Earth`s surface rises its temperature. The fall in rate of cloud seeding also decreases the volume of rainfall. Besides sunspot changes, the external bodies like meteorites, which fall on the Earth’s surface at a speed of approximately 10-75 kilometres per second after passing the thick layer of atmosphere, are also believed to have some impact on terrestrial climate . At this speed when these interplanetary bodies come in contact with even the thinnest of atmospheres, generate heat from both friction and compression. And the temperature and dust released at the time of their collision, sometimes alters the climate significantly. Several studies have attempted to substantiate that sudden climate change caused by heavy meteoritic shower in Cretaceous period was the cause behind extinction of dinosaurs from earth [6-8]. Volcanic eruption is also a short-term forcing that affects the climate through injecting a large amount of ash, sulphurous gases, halogens and water vapor into the Earth's atmosphere [9,10]. These gases and aerosols produce a cooling effect by reducing the amount of insolation. However, the extreme amount of volcanism can also produce global warming [11,12]. The El Nino–Southern Oscillation (ENSO) phenomenon is another short-term climate forcing that is characterised by a warm (El Niño), neutral and cold (La Niña) phases. The warm phase of the ENSO event is associated with higher precipitation in the Eastern Equatorial Pacific and reduced rainfall in Western Equatorial Pacific when compared with neutral condition. These patterns are reversed during the La Niña phase [13-16]. Scientific accounts find a good connection between El Niño phenomena and a week monsoon over India. They observe that during El Niño years, it is more likely that India receives less rainfall than normal [17-19]. Apart from these short-term forcings, the long-term climate agents also affect the climate as well, however, they are very slow-moving forces, and would not be very helpful in explaining short-term climate fluctuations. Hence, present study considers only the short-term climate agents for its investigation, and takes India as a case of analysis. It is important to mention that no significant occurrence of meteoritic impacts or volcanism have been recorded in India during last century. The study, therefore, analyses only the sunspot changes and El Niño events to understand the departure of climatic variability from its natural path. The study is based on the temperature and rainfall series of 116 years (1901-2016), collected from India Meteorological Department. The data pertaining to Oceanic Niño indexes of past of 52 years (1961-2012) was obtained from the National Centers for Environmental Information, Boulder, USA while the data related to annual change in mean sunspot numbers during last 102 years (1911-2012) was collected from the World Data Center, Royal Observatory of Belgium, Brussels. The study uses simple correlation and regression analyses to examine the degree of association of sunspot and ENSO events with temperature and rainfall. India, which is a country of monsoon climate, witnesses seasonal trend reversal of pressure and wind system during the year. The Tibetan plateau and the Himalayan mountains situated in the north, Thar desert in the west and Indian ocean in the south of the country, make its climate unique and diversified, varying from tropical to temperate and from desert to alpine conditions. The country receives most of its rain during summers while faces extreme cold conditions in north and mild temperatures in the south during winters. In recent decades India has recorded an increase in extreme climate events and there are several studies which link this change to rapid humanization of Indian landscape [20-22]. Figure 1 shows mean annual temperature and rainfall profile of India. The figure also shows that during months of June, July and August when country receives most of its rainfall the minimum temperature conditions remains stable while the maximum temperature records remarkable decline. Figure 1: Temperature and rainfall profile of India. 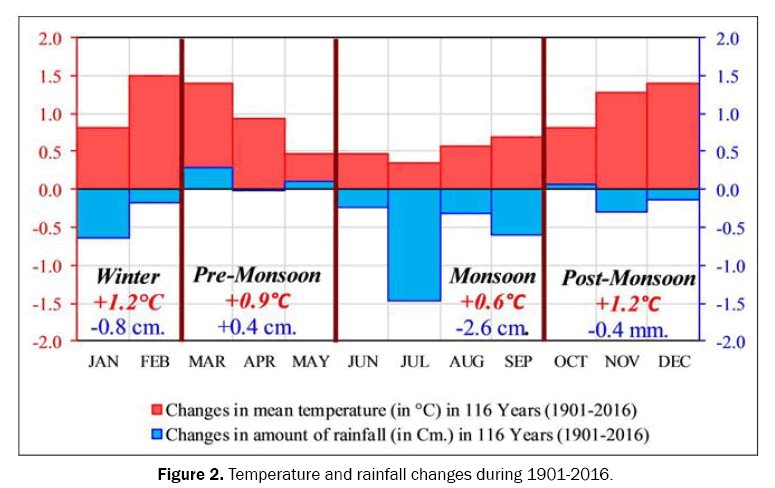 Figure 2 demonstrates the monthly and seasonal changes in temperature and rainfall conditions of India during last 116 years (1901-2016). Evidently February, November and December are the months that have recorded highest increase in temperature and on the other hand the month of July has witnessed maximum decrease in volume of rainfall. It is clearly visible from the Figure 2 that winter and post-monsoon seasons are gaining heat, while the Monsoon season has noticed a decline in rainfall. Figure 2: Temperature and rainfall changes during 1901-2016. Figure 3 displays the temperature and rainfall pattern of India for 1901-2016. A sharp increase in temperature and a significant decline in rainfall after the year 1990 is quite evident. Virtually the year of 1990 can be termed as ‘climate dividend’ for India. Actually, this was the period when India opened its market for foreign investors to install industrial units in the country. 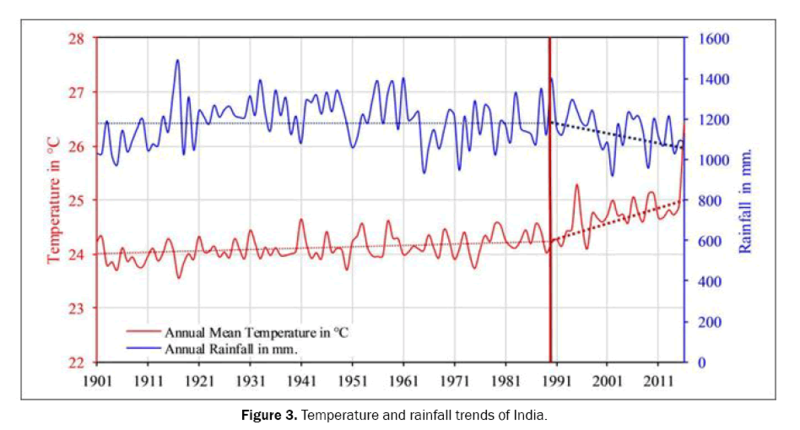 Figure 3: Temperature and rainfall trends of India. It is evident that the India’s climate is shifting towards hot and dry conditions and this change is more evident for last 2 decades. Table 1 shows the correlation between annual mean temperature, annual rainfall and annual mean sunspot numbers for a period of 102 years (1911-2012). Table 1. Correlations between sunspot numbers and temperature and rainfall. Notably the correlation between sunspot numbers and temperature is positive for all states. This relationship is significant in case of Sikkim, Odisha, Nagaland, Arunachal Pradesh, West Bengal, Jharkhand, Assam and Bihar while the statistical insignificance for most of the states can be attributed to geographical variations. Nevertheless, the unidirectional covariance of sunspot activity and temperature change shows that temperature trends are mostly being governed by the incoming solar radiation. The uneven rise in surface temperature can be understood by differences in surface reflectivity and regional geography. For example, same amount of insolation will produce more warming on darker or flat surface and less on the light or undulating surface, like in Rajasthan, a large area of land comes under desert which reflects more energy and thus, is not as warm as Andhra Pradesh, Telangana, or Northeast states which is marked by surface of vegetation cover absorbing more solar radiation. On the other hand, the state of Punjab is known for its green fields, absorbing more heat, but due to intense irrigation, this heat produces a ‘partial cooling effect’ as the naturally enhanced temperature spends its energy for evaporating the field waters. The state of Haryana along with the Chandigarh and NCT of Delhi is under the ‘partial cooling effect’ of urban heat islands as the extra heat accumulate in local atmosphere enhances the rate of evaporation and thereby atmospheric water vapour content. This effect is visible in the rainfall patterns of these states as they have received more rainfall due to the enhanced water vapour in their local atmosphere. The ‘partial cooling effect’ of urban heat island is also working in case of Kerala and the state has recorded a less warming than its neighboring states. The relationship between sunspot number and rainfall is not very clear, yet, due to low cloud seeding during increased sunspot activity, it can be suggested that the rainfall will decline. The correlation between sunspot numbers and the rainfall partially support this idea. It can be gauged from Table 1 that almost half of the states of the country are showing negative relationship between sunspot activity and rainfall. However, owing to the two-tailed relationship, no definite association can be interpreted. It can be said that the rainfall depends more on local atmospheric conditions rather than external forcings. The second natural short term forcing for temperature and rainfall changes is the El Niño-La Niña oscillation. This is measured in Oceanic Niño Index (ONI). Table 2 presents the correlations between Oceanic Niño Index and temperature and rainfall for a period of 52 years (1961-2012). Table 2. Correlation between oceanic nino index and temperature and rainfall. The Table 2 shows that during El Niño years, temperatures were high over India and also that there was more rainfall during such years. Although the rainfall-oceanic Niño index correlation is insignificant for most of the states, yet few have recorded a significant positive correlation. This goes against the so called El Niño-Monsoon relationship that during El Niño a less rainfall is expected over India. However, the two-tailed relationship between El Niño and temperature, and El Niño and rainfall limits the possibility of predicting any significant association between these two variables. The positive correlations between Sunspot cycle and Temperature patterns show that solar activity is a critical determinant of regional temperature profile of the country, however, the degree of correlation between sunspot numbers and temperature patterns for most of the states is very weak. On the other hand, the sunspot cycle-rainfall association is two tailed and do not support Svensmark, and Friis-Christensen`s cosmic theory of climate change. It is noteworthy that most of the coastal states of India record a good correlation between Oceanic Niño Index and Temperature. This simply means that during El Nino years, Indian coast becomes warmer than usual, and thus, this phenomenon disturbs normal monsoon mechanism by easing the pressure gradient developed over the country. However, the correlations between El Niño and rainfall patterns do not justify the hypothesis that during El Niño years India gets less rainfall than normal. Pachauri RK, et al. Climate Change 2014: Synthesis Report. Contribution of Working Groups I, II and III to the Fifth Assessment Report of the Intergovernmental Panel on Climate Change. IPCC, Geneva, Switzerland. 2014:1-151. Summary for Policymakers. In: Climate Change 2013: The Physical Science Basis. Contribution of Working Group I to the Fifth Assessment Report of the Intergovernmental Panel on Climate Change. IPCC, Cambridge University Press, Cambridge, United Kingdom. 2013. Carslaw KS, et al. Cosmic Rays, Clouds, and Climate. Science. 2002;298:1732-1737. Svensmark H, et al. Variation of Cosmic Ray Flux and Global Cloud Coverage-A Missing Link in Solar-Climate Relationships. J Atmos Sol Terr Phys. 1997;59:1225-1232. Kohler E, et al. Planetary Atmosphere’s and Meteorite Impacts in the Inner Solar System. Meteorite Magazine. 2011;17:40-43. Ganapathy R, et al. A Major Meteorite Impact on the Earth 65 Million Years Ago: Evidence from the Cretaceous-Tertiary Boundary Clay. Science. 1980;209:921-923. Alvarez LW, et al. Extraterrestrial Cause for the Cretaceous-Tertiary Extinction. Science. 1980;208: 1095-1108. Russell DA, et al. Supernovae and the Extinction of the Dinosaurs. Nature. 1971;229:553-554. Gao C, et al. Volcanic Forcing of Climate over the Past 1500 Years: An Improved Icecore-Based Index for Climate Models. J Geophys Res. 2008;113:1-17. Crowley TJ, et al. Volcanism and the Little Ice Age. Pages News. 2008;16:22-23. Robock A, et al. Volcanic Eruptions and Climate. Rev Geophys. 2000;38:191-219. Timmreck C, et al. Modeling the Climatic Effects of Large Explosive Volcanic Eruptions. Wires Climate Change. 2012;3:545-564. Salau OR, et al. Modeling the ENSO Impact of Orbitally Induced Mean State Climate Changes. J Geophys Res. 2012;117:1-14. Collins M, et al. The Impact of Global Warming on the Tropical Pacific and El Nino. Nat Geosci. 2010;3:391-397. Chavez FP, et al. Biological and Chemical Response of the Equatorial Pacific Ocean to the 1997-98 El Nino. Science. 1999;286:2126-2131. McPhaden MJ, et al. The Tropical Ocean-Global Atmosphere Observing System: A Decade of Progress. J Geophys Res. 1998;130:14169-14220. Pant GB, et al. Some Aspects of an Association Between the Southern Oscillation and Indian Summer Monsoon. Arch Meteorol Geophys Bioklimatol. 1981;1329:245-252. Francis PA, et al. Towards Understanding the Unusual Indian Monsoon in 2009. J Earth Syst Sci. 2010;119:397-415. Sajani S, et al. Prediction of Indian Rainfall during the Summer Monsoon Season on the Basis of Links with Equatorial Pacific and Indian Ocean, Climate Indices. Environ Res Lett. 2015;10:1-13. Mishra A, et al. Changes and Challenges of Climate in India. Int J Environ Sci ‎Nat Resour. 2017;4:1-5. Mishra A, et al. An Assessment of Climate Change-Natural Disaster Linkage in Indian Context. J Geol Geosci. 2014;3:1-167. Field CB, et al. Managing the Risks of Extreme Events and Disasters to Advance Climate Change Adaptation. IPCC, Cambridge University Press, Cambridge, UK. 2012:1-582.